Though Thomas Johnson of Harrogate was first listed as a silhouettist in Silhouette by Mrs Jackson (1938), very few examples of his work are known even today. The Victoria & Albert Museum in London holds two silhouettes of ladies by him, and a gentleman was sold in 1995 as part of the Christie Collection. These are all illustrated in British Silhouette Artists and their Work by Sue McKechnie (1978). This further example of a stylish but unnamed lady has recently come to light. It was previously sold by Sotheby’s in May 1977 when it fetched the top silhouette price of the day. 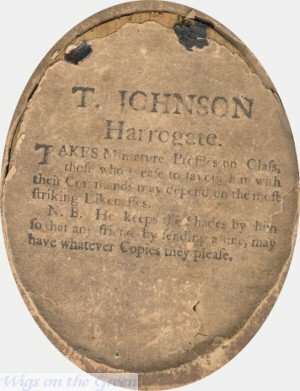 Johnson was working at the end of the eighteenth century in Harrogate, a popular North Yorkshire spa town where visitors could bathe in the sulphur baths, perhaps more accurately named the ‘stinking wells’, and could drink water high in iron from Tewit Well as a cure for a myriad of illnesses. Johnson would therefore have been guaranteed a fashionable clientèle. It was a period of elegant and flamboyant dress still influenced by the French court. 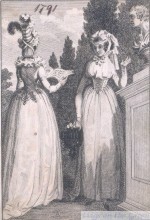 To accessorise their dress, ladies typically wore tall hats trimmed with ostrich feathers, ribbons and coquettes as evidenced by these fashion plates from 1790 and 1791. 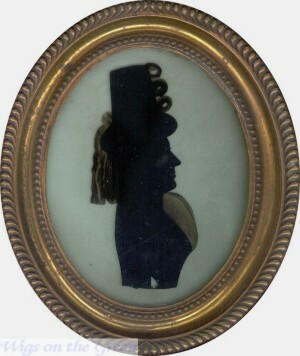 Johnson painted bust-length silhouettes on flat glass using heavy black paint. He used a needle to scratch the hair details and thinned paint to create some transparency for the dress. He then backed the profile with a second piece of flat glass coated with gesso, a technique also used by the Jorden brothers. This creates a greenish hue resulting in better definition. All the known examples of his work are housed in brass-faced oval frames and are backed with his trade label. have whatever Copies they please.